Want to make more money with your eBay auctions? 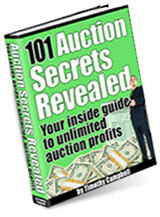 Want to decrease the amount of time that you spend listing your auctions? Want to decrease the amount of time that you spend filling orders? And which are the best items to sell on eBay? How about some useful tips that will give your ads a better look? What about knowing when to list and end your auction? And how to get people to look at them? It provides answers to all the questions, and is a must-read for for all eBay Buyers and Sellers! This amazing guide will show you how to as a Buyer, get the lowest prices possible; and as a Seller, how to sell your products for the highest profit possible. Download it now!